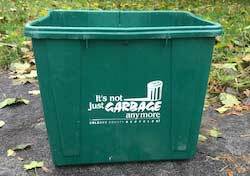 Provided photo courtesy of Modern Disposal: Modern Disposal will be transitioning to 96-gallon garbage totes in 2019, with a goal to have them in place by July 1. Photo by Tom Rivers: The smaller recycling bins will be replaced by much larger totes in 2019. ALBION – Orleans County will be transitioning to new 96-gallon recycling totes in 2019. The change will make it easier for Modern Disposal to pick up recycling, and should hold off increases in the costs for picking up garbage and recycling for the next few years, county officials said. Residents currently use recycling bins that are emptied weekly by Modern. The company has two employees per truck, with a driver and another employee grabbing and emptying the bins. It takes about a minute for each stop in the county. Modern will be switching to 96-gallon totes that have covers. Those totes can be grabbed by a mechanical arm, lifted into the arm and emptied into the recycling truck. “It’s a way to keep the costs in line,” said Chuck Nesbitt, the county’s chief administrative officer. Residents in 2018 paid $212 for annual garbage and recycling collection. The cost will stay about that price for the next few years with the recycling change, Nesbitt said. “Otherwise, we are looking at a 10 to 15 percent increase,” he said. Modern also will pick up the recycling every two weeks, instead of weekly once the totes are in place. The county needs to purchase about 15,000 of them at a cost of about $55 or about $800,000 total. Nesbitt said a state grant from the Department of Environmental Conservation is expected to cover half the costs. There will be public information meetings next year to help prepare residents for the changes. Nesbitt said the new recycling program has a July 1 target date for kick off. 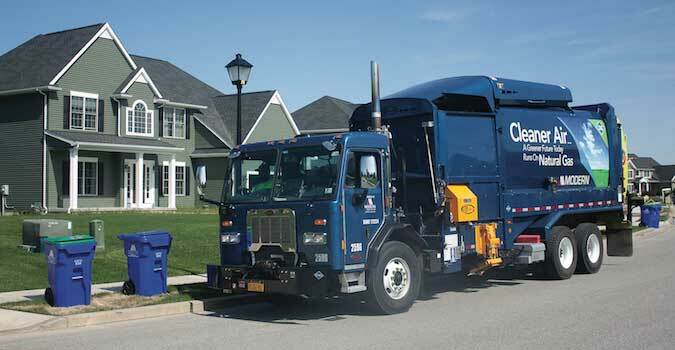 The County Legislature last week approved a new five-year contract with Modern for garbage and recycling collection. The annual cost is $3,001,495 with the current system, but drops to $2,707,160 when the new system is fully phased in.